Back down from the mountain. When we arrived in the vicinity of the mountain, we were still planning to take a train to its top. It's not that we had actively decided we didn't want to climb it; it's that we didn't even consider climbing all the way to its top. I, for one, would have thought that scaling the whole thing would be a near-impossibility for me, given my desperate fear of falling. But then we ate a big breakfast on our first morning in Wales, and I said, perhaps we should do our walking first and our mountain train trip second, since we have all this food in us now. And then we saw the mountain and decided we'd see what we could do. 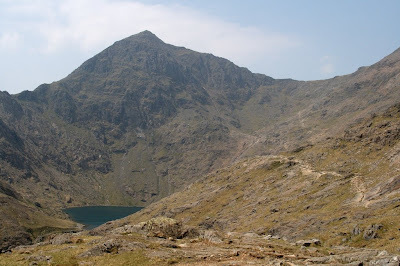 There's a low road, called the Miner's Track, and a high road, called the PYG Track, and an even higher road, called the Snowdon Horseshoe. "Every summer," a guidebook told me, "countless people find themselves atop Crib Goch, on the horseshoe, scrambling over rocks with nothing on either side of them, and wish that they weren't there." When the moment came, we chose not to ascend to Crib Goch. Sometime in the second hour of our climb, I began to realize what it was that I was doing, and then things got very exciting indeed. It's not that we ever needed to rock climb; Snowdon's paths are well delineated and maintained. But we did ascend something like 300 meters in the space of 30 minutes, near the very end--a feat for which my calves are still paying a bit of a price--and then we ascended some more, and then we were at the highest point in England and Wales, up in the high winds, above ridges and lakes and stark blown grass. And almost above fear. If I weren't so tired, I'd give you more details this evening. 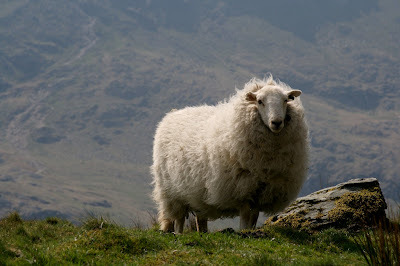 As it is, they'll have to come tomorrow--but here's a sheep to keep you company. The sheep also joins me in saying Happy Mothers' Day to all of you mothers out there. In my world, every day is mother's day: my mother is that completely awesome.